Hoosier worked with our fuel retail client and their consultant to manage the replacement of a water main and associated service lines in the area of concern. The project involved Hoosier coordinating efforts with a local plumber to remove and re-install new plumbing including over 140’ 8” pipe and 250’ 6”pipe and associated fittings. The team worked to safely excavate, expose, remove and replace the piping and coordinated the off-site transport and disposal of impacted soil. 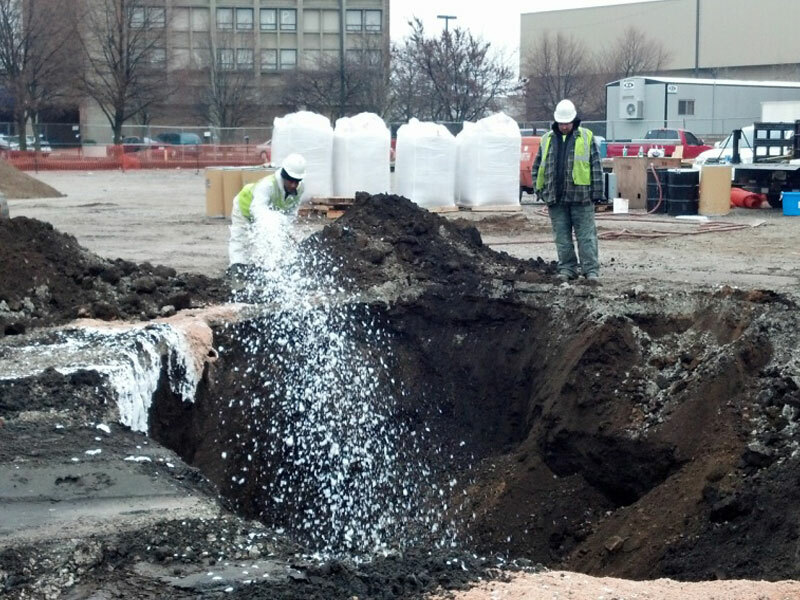 The trenches were backfilled with flowable fill and resurfacing included both asphalt and concrete restoration. The client was thrilled when this challenging project was successfully coordinated with local officials, our local sub-contracted team and ultimately came in under budget! 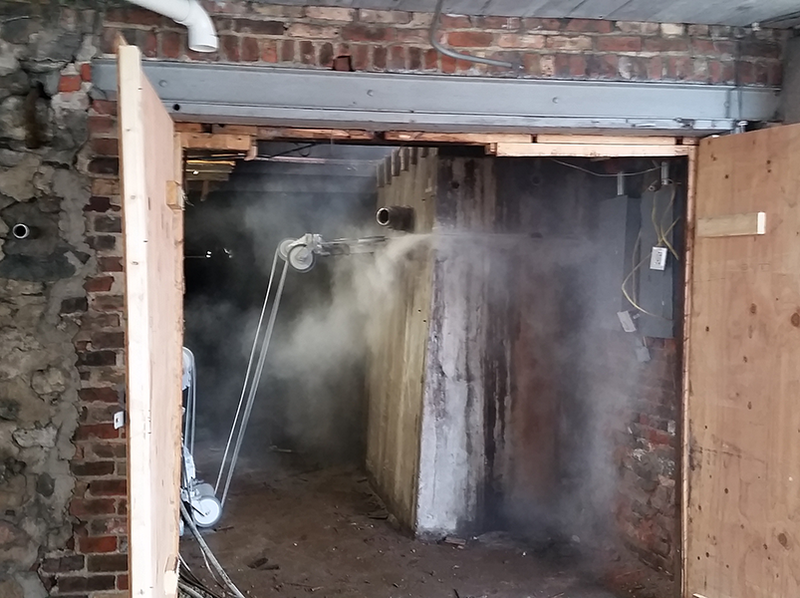 Hoosier worked with the client to demo and remove remaining equipment in a tight interior environment. The facility was two-stories with a substantial concrete pillar requiring removal and subsequent structural support while remediation efforts took place. Hoosier sub-contracted a professional concrete cutting firm to cut the pillar into manageable pieces then once removed Hoosier performed sub-surface shallow excavation taking great care not to damage the historic building structure. Hoosier mixed a remedial agent into the native material that remained with water and re-mobilized to backfill and re-surface the disturbed area. For this project, Hoosier removed and recycled surface concrete, excavated and transported 2,600 tons of impacted soil, properly removed one previously abandoned 4,000 gallon UST from the site and performed site restoration, which included backfill with compaction and resurfacing the disturbed area to match surrounding grade. This project was completed in accordance with ELTF bidding and invoicing guidelines per the client’s request. 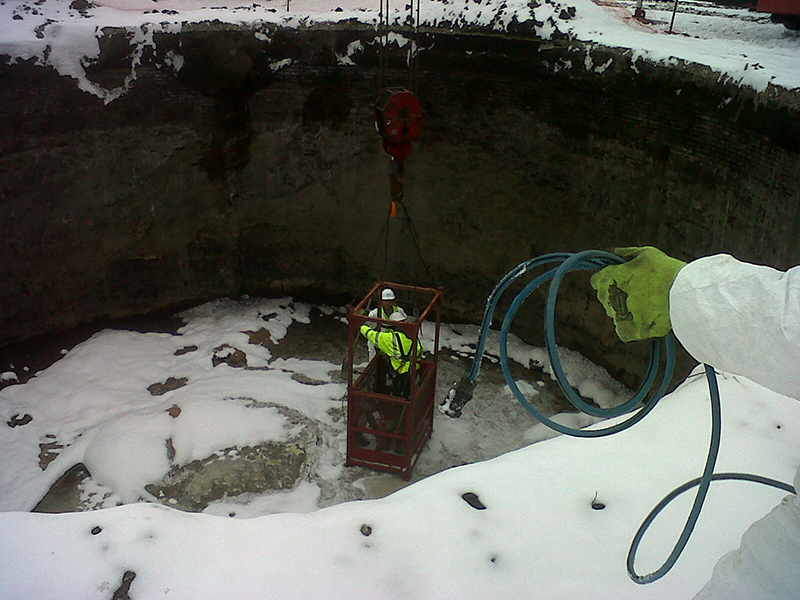 Per the client’s request to facilitate on-going operations and planned development at this particular site, remedial excavation (and shoring) was performed in two phases. 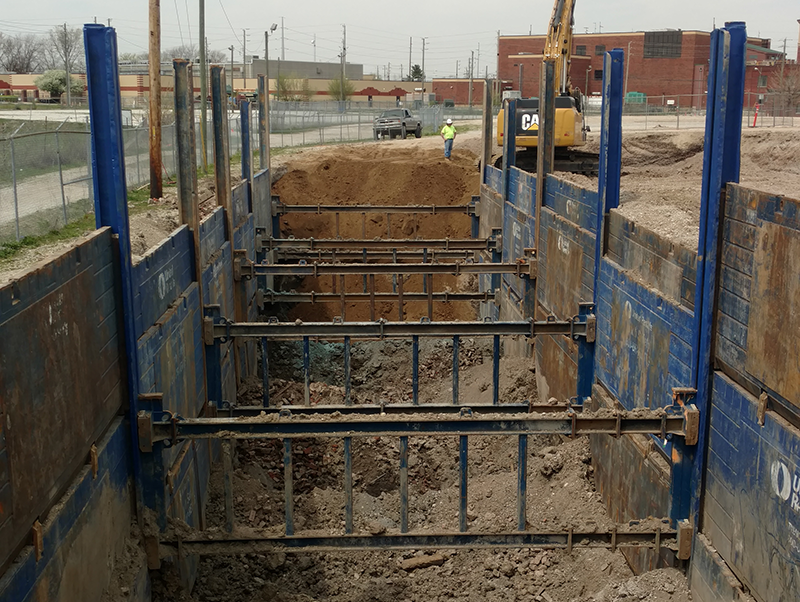 During these two phases Hoosier worked with our shoring sub who installed helical piers to support the adjacent structure(s) and then we successfully completed the removal and transportation of over 2,500 tons of solvent impacted soil. Hoosier restored the site per the client’s specification by importing and placing 53 stone to meet compaction testing standards. Hoosier Equipment is an industry leader in the Midwest, providing turn-key solutions for environmental construction and remediation challenges.